This disc was obviously meant to be a batch of catchy, mature love songs from Papa Roach, but just some three minutes in, it all goes horribly wrong. Nü-metal flunkies Papa Roach seem to be appearing in all the wrong places at the wrong times. This first occurred when the band refused to gracefully bow out of the music business after their experimental sophomore lovehatetragedy was given a mediocre sales reception, and second, after last year's overplayed runaway hit "Scars". Before that moment in history, the fourpiece were quite happy to churn out forgettable, pedestrian rap-rock about suicide, rejection, murder, and the evils of society, with little or nothing to distinguish it from influences like Korn or Limp Bizkit. But it seems "Scars" has raised the bar, as a radio-friendly, long-standing smash hit would for any band, so upon listening to The Paramour Sessions, their refined and slickly produced fourth album, you really, really want it to be something spectacular enough to convince us that the band won't now fade away into obscurity like so many of their contemporaries. But, alas, the disc as a majority can more or less be summed up with the happy-go-lucky words in the chorus of first single "...To Be Loved": "Whoa-oh! / I never give in / Whoa-oh! / I never give up / Whoa-oh! / I never give in / And I just wanna be, wanna be loved". The Paramour Sessions, as its title suggests, is a whole hour of half-'80s-glam, half-rap-metal love songs -- is it really surprising that they've been touring in support of Guns 'N' Roses and look a lot like vintage Mötley Crüe? But, for all these retro stylings and band attempts at reinvention, Papa Roach are hampered by a massive problem more often than not: they're dull as dishwater musicians (at least most of the time) trying to sound earnest. There are a couple of moments on the album when they escape the bland conventions they've created for themselves over the years. The washy ballad "Forever" strikes up a lighter-waving atmosphere and includes decent enough strumming from guitarist Jerry Horton. "What Do You Do?" has just enough strength and pace to make it something of a minor hit if released, and "Crash", about the only upbeat song that actually works to a certain extent, is a grinding fusion of crunching instruments and breathy vocal anger. But the rest of the material here decides either to rewrite "Scars" or follow a path of soft-loud post-grungery that Nickelback have made infamous on radio. Frontman Jacoby Shaddix himself isn't much of a singer even when he gets his mouth working, and he sounds absolutely laughable delivering a number like "The World Around You", which is actually -- get this -- supposed to be a social commentary: "Take a look at the world around you / Can you see the desperation?" -- it gets worse than that, too, believe me. And while "...To Be Loved" is catchy in the right spots, tracks like "I Devise My Own Demise" and "Alive (N Out of Control)" turn up the volume and move as fast as possible to disguise the fact that they're nil on new ideas for the group, while insulting closing ballad "Roses on My Grave" introduces strings for a pitiful swipe at 'emo' sincerity. And throughout it all, nothing really original or truly eye-opening turns up. 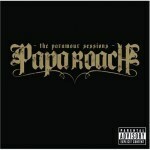 Because of this, The Paramour Sessions may be of interest to fans of the genre or the band, but everyone else would do best to stay away from the entire package and only pursue the few cuts worth checking out -- and, as Papa Roach probably know which ones they are as well as we do, they'll probably be released to radio in due time. Everything down to the band's new logo, a seemingly unpleasant homage to that of Mayhem, is pretentious. In fact, the album, taken as a whole, even if they are trying their hand at their own evolution and now have better production working for them than ever before, well deserves the minimal hype it received upon its release, and is ultimately further proof that the band are dragging it on well after their use by date.